Inspiration can come from many different places, and one of the best sources is the people around us. It’s amazing how easy is it is to become interested in something, simply because it is a favorite of someone we love. Many of us even began our obsessions with beads thanks to a friend or relative that introduced us to the craft. 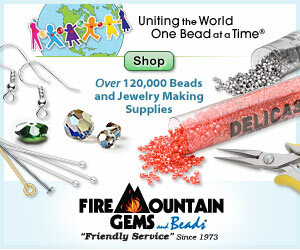 I find that my bead helper's interests provide a constant source for new adventures and inspiration. He has helped me remember how much I like Batman and Harley Quinn, and given new meaning to the Star Wars franchise. Lately, our obsession has become dinosaurs. Prehistoric beasts are now the dominating topic in my workspace. I borrow dinosaur books from the library, and have watched BBC’s Walking with Dinosaurs and related documentaries many times on Netflix. So when it came time to decide on a color palette for this month’s bead triads, dinosaurs were the first thing that came to mind. Very little is known about what dinosaurs actually looked like. The images of living dinosaurs that we see in books and movies are based on educated guesses. Scientists take what they can learn from fossils, geology of the time period, and modern animals, and piece things together. The texture of dinosaur skin is the only sure thing, and color is pretty much a shot in the dark. Still, it’s easy to imagine what colors may have been common during the Mesozoic era. Natural, earthy shades of greens and browns are pretty likely. 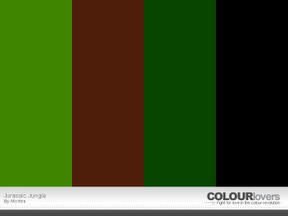 These are the colors that we most often see in dinosaur art, and they are the inspiration behind today’s palettes. Dragon Garden features an interesting contrast of colors and hues. It started with a strand of dyed wood beads, with a subtle flower pattern in dark brown and pink. I added 8/o seed beads in transparent jade, which blend in nicely. These two colors alone would make a great necklace. A shock of apple green 11/o’s add extra life to the palette. They would make pretty flower accents in a boho inspired design. Herbivore started with some Christmas green pressed glass leaves with a vitrail finish. Since this would be the darkest of the greens in the palette, I added chartreuse magatamas for the lighter half. The two didn’t exactly fit together until I added the warm transparent rootbeer seed beads. They provide a neutral background that allows the greens to work together. I love these palettes! I love the earthy tones of the jungles and forests, with or without a dinosaur! LOL. Great job, thank you. I'm going to print these out and paste them into my color journal. I keep a journal of color combinations I like because I am so inept in creating them myself! What a great idea! I do the same thing with fashion magazines. Once I've read through them, I clip out colors, jewelry, shapes - anything that might inspire me later.